Trail mix is a great source of magnesium. If you're interested in learning more about nutrition and how various nutrients can benefit your health, there are lots of interesting facts about magnesium that will appeal to you. Magnesium is essential to the body, and is likely already a part of your diet. Magnesium is a mineral that is vital to the human body. Most of the magnesium found in the body is located in the bones, with the rest of it found in muscles, organs and body tissue, and a very small amount circulating in the blood stream. Magnesium also combines with other vitamins, minerals, and enzymes to perform many of the functions most people take for granted. Vegetarians who consume eggs and dairy can also get magnesium through milk and other dairy products. Tap water can be another source of magnesium, or you can opt for bottled mineral water. 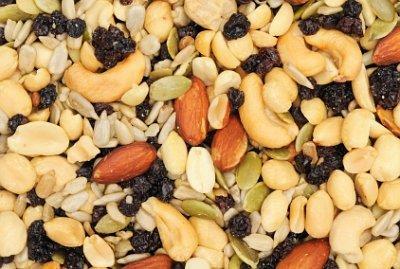 For a quick boost of magnesium, try snacking on trail mix, which is composed mostly of nuts and seeds. It is very rare for most people to suffer from magnesium deficiency, but it does happen occasionally. For those with diets high in processed foods, and low in vegetables and other healthy options, a magnesium deficiency can result in very serious health problems.While magnesium makes up only a tiny amount of the human body's overall composition, it's amazing to note how a lack of this essential mineral can affect its function. Here are some of the symptoms and conditions that can be caused by a low magnesium intake. If you're concerned that you might not be getting enough magnesium in your diet, see your doctor for a simple test to check the levels in your body. Extra magnesium can be administered intravenously, and your diet will need to be adjusted. If your diet is varied and includes a variety of green vegetables, legumes, nuts, seeds, and other sources of magnesium, there's no need to worry that you're consuming too much. High magnesium intake usually occurs due to an overindulgence in supplements. The only real side effect that will result from an overdose of magnesium supplements is a case of diarrhea. Magnesium makes up less than 0.1% of the human body. It's surprising to discover, however, just how important this mineral can be to help you stay healthy and perform at the best of your ability. If you've been experiencing any of the symptoms of magnesium deficiency, try boosting your diet with some of the recommended, healthy foods.